The Vulcan Skyhook is probably the best manufactured, strongest, stiffest and most vibration resistant multi-rotor frame on the market today. We have combined this with the Wookong M flight controller and the industry leading DJI Zenmuse 3 axis stabilised camera gimbal to create a fantastically stable flying camera platform currently fitted with a 4K capable Panasonic GH4. At 670mm ‘wingspan’ the Quad 670 is a smaller, lighter and more agile aircraft which is perfect for carrying smaller cameras, especially the wonderful GoPro. In situations where fast flight is required to track moving objects this is a great platform. 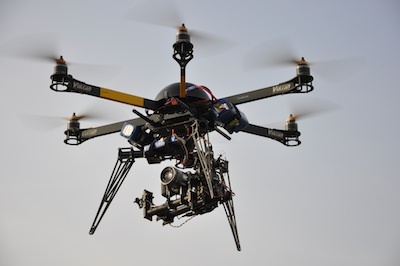 The Quad 670 carries a DJI 3D Gimbal loaded with a 4K capable GoPro Black4. This is a 3 axis gimbal and gives the same flexibility to our camera operators as the larger Zenmuse gimbal carried by our Hex. We are able to transmit a live ‘camera’s eye’ view down to the camera operator for any of these cameras, allowing precise composition and control. This can be done in standard definition or HD depending on your requirements.